Wych elm once covered large parts of the UK. Following the last ice age, as woodland became the dominant form of vegetation, Wych Elm stood out as one of the success stories. For a few thousand years it flourished, but then succumbed to what is thought to have been a disease very similar, if not, Dutch elm disease. About 5,500 years ago, the population of Wych Elm – the only native elm here – was drastically reduced. At the same time, humans, with their rapidly developing tools, were clearing larger and larger areas of woodland for farming. The death of so many elms must have helped them. 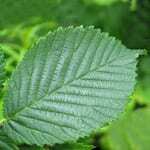 Wych Elm leaves are alternate, oval to elliptic and have a long pointed tip. The base of the blade is unequal. The dark green leaves have toothed edges and hairs on both sides. The upper surface of the leaves feels like fine sandpaper. 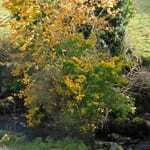 In autumn they change from dark green to yellow. If they change to yellow in mid-summer, the cause might be Dutch elm disease. 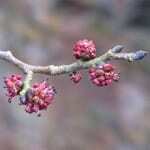 Flowers of the Wych Elm are purplish-red and are held in bunches of 10 to 20, spread along the twigs. They appear in early spring before the leaves to aid pollination by the wind. Both male and female reproductive parts are contained within each flower – so they are hermaphrodite, like the Ash. The fruits are small and winged, about 1cm across with a single seed in the centre. At first they are green but when they are ripe – in late May or early June – they are brown. 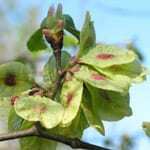 By reproducing from seed, it is said that wych elm can develop a resistance (not immunity!) to Dutch elm disease. 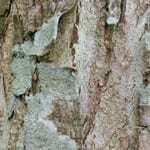 The bark varies from grey to dark brown with long, vertical creases. The elm bark beetle (Scolytus multistriatus) tunnels under the bark of elm trees carrying with it a fungus – Ophiostoma novo-ulmi, which invades the tree. It blocks the flow of life-giving sap, eventually killing the tree. 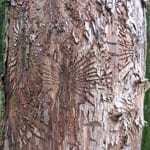 This is ‘Dutch elm disease‘. Wych elm is a long-lived tree if it can elude Dutch elm disease. It grows on rich and moist soil, preferring a cool summer with damp air – perfect for the north and west of the UK and most of Ireland.